The other night I was catching up on my youtube vids and I was inspired by a youtuber out there named Eily. She's just fab! I recreated her recent teal look and added my own twist. You know blues and greens are my fav! 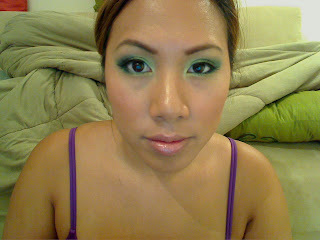 Next time, I'll try foiling the pigments and shadows to make the colors really pop. I used my airbrush system to do foundation. I had to do a new color mix since I got a slight tan in Costa Rica...when I mean slight, very very light tan, lol, since it rained most of the time! I ended up combining two colors to make my mix: 1/3 number 8 mixed with 3/2 number 7. I love the way that airbrush foundation offers a lot of coverage but feels like you're not wearing anything. 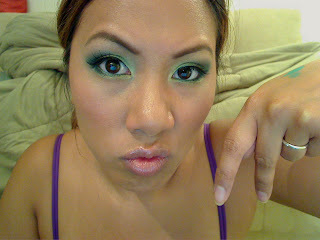 I took these pics after midnight...I think I was tired cuz one of my eyes is bigger than the other in these pics, lol. And yup, that's the boyfriend sleeping in the background...I threw a blanket on top of him to cover him up, lol. LOL you are too funny... The green blanket compliments your eyes though, lol. 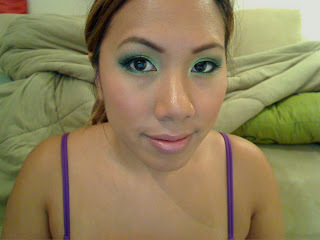 I like the green- I've been wanting to try that for a while. tell us more about this airbrushed foundation. where do you get the spray gun from? and how much did it cost? tell us more! lol about the blanket!! girl, you are talented-I cannot airbrush myself to save my life! This is beautiful on you Ren!! Hi there-oh this colour looks very fresh and pretty on you, delicate yet noticeably radiant! wes: girl green would look hot on you...try it! yellow fever: yah it's hard to airbrush yourself! lol i tried doing the e/s and it took me forever! nic: thanks it's my fav color! sharonrose: so the subtley works, goody! gezebel: awww G, i loves yah girl! hi im abby from sogirly.nu and ive been watching your videos from time to time and i love them. btw i love the green look its really nice. looks sooo finished. OMG your face is gorgeous, ate Ren!! :) sigh! Your skin is perfect and your blush look so natural and the green look looks BLOOMING!!! DASHING on yoU!!! I love this! nice! i love teal/turquoise looks. its kind of a harder color for me to wear tho. Nice eyes! I love the lippie with it too! Ren is so prettyyyyyy! love the green, maybe i'll try it.